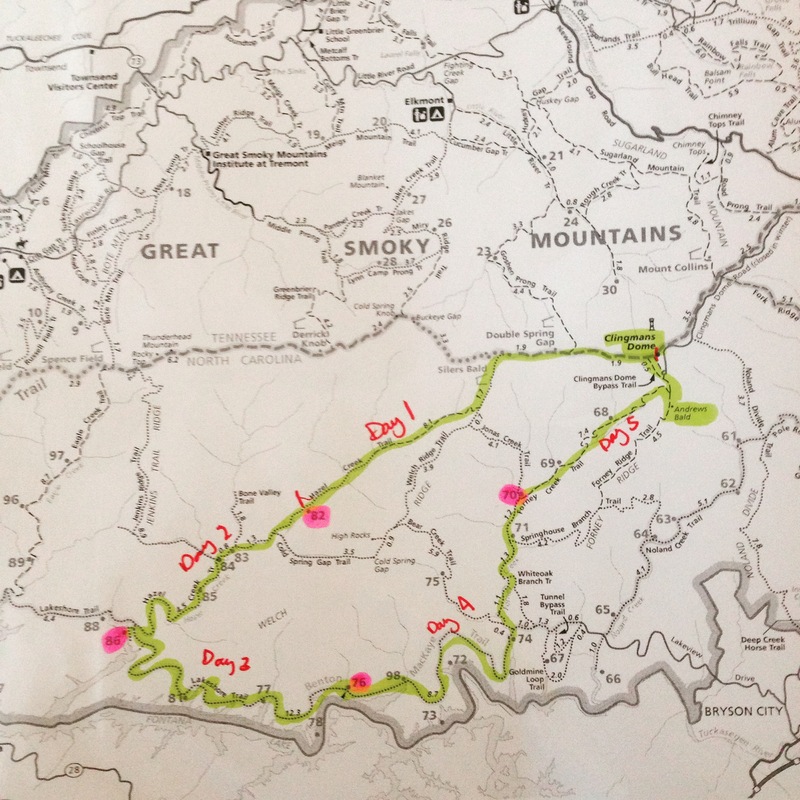 Night 2/Day 3: Hazel Creek/Forney Creek Loop. We woke up in the middle of the night to the pitter patter of rain on the tent. This was our first experience using the tent in rain, so we clicked on a light to make sure we weren’t getting any rain inside. There was a small pool starting to form on Bill’s side of the tent, so we looked around for other signs of leaks. As I was searching, I noticed some clips on the four corners of the tent, which attached to a loop on the “bath tub”. Oh, we should have attached those earlier, as it helped lift up the sides of the bath tub to prevent water from entering the tent. Duh. Our lack of experience showed a bit, but we were lucky. Thankfully there were no other wet spots, and we could get back to sleep mostly confident that our tent would keep us dry through the night. I had a bit of difficulty falling back to sleep. Not because of the rain, but because my whole body ached from our hike so far. I could not believe we still had 3 more days to go. And long ones at that! 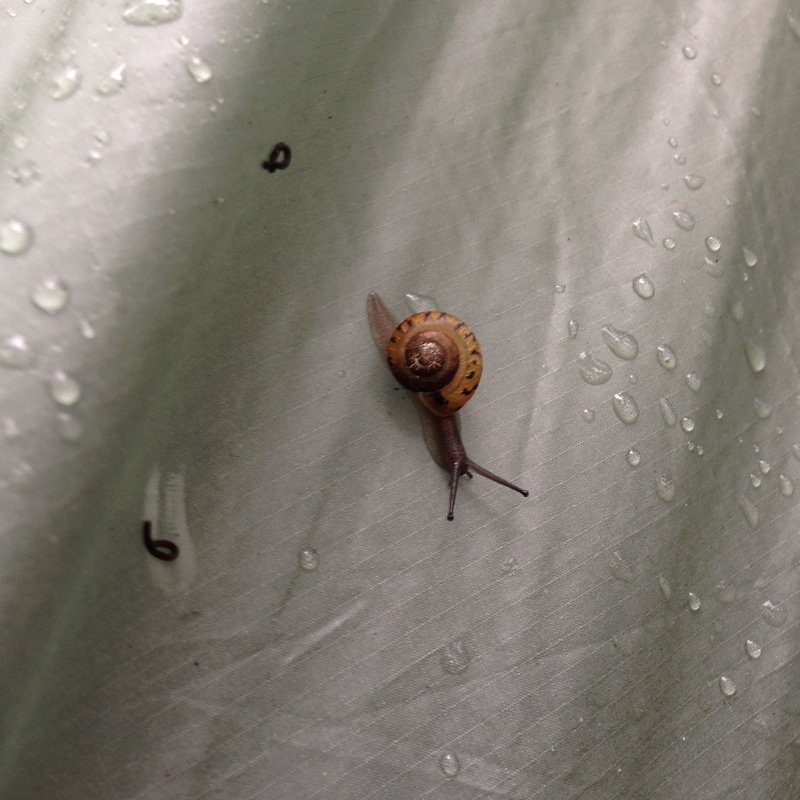 This snail was on the outside of the tent when we woke up! By morning, the rain had stopped, so we got up and started our morning chores. Bill pulled down the bear bag and searched for any dry fuel he could find for making breakfast, while I packed up our sleeping kits. We enjoyed some hot oatmeal with dried strawberries and bananas with a cup of vanilla chai on the side. We were fueled and ready to go, looking forward to our “easy cruise.” I put on my Vivos again; just the thought of putting on my Lunas made my feet hurt. I knew we didn’t have a lot of river crossings today, so these would probably do just fine. We initially left camp by turning right, which took us along the shores of Fontana lake, where the water was crystal clear and we could see hundreds of trout swimming around. I’m not a fisherman, but I’m pretty sure I could have caught something there. 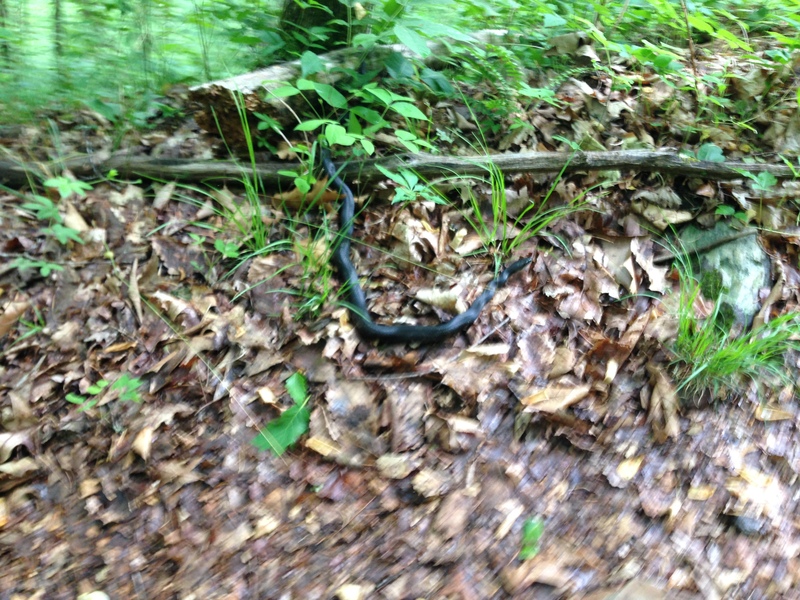 We also spotted a small snake and heard what I’m presuming was the call of an elk, or some other large mammal. We quickly realized that we had gone the wrong way out of camp, because the trail ended. Whoops. We backtracked to the sign that had directed us to the campsite, and realized that we needed to go in the opposite direction. At that crossroads, we saw our first real hiker since we left the AT. There was a man stopped at the sign, who had been backpacking with a few others who were on the other side of the bridge at that point. He told us that they had come from campsite 81, pointing in that direction. That’s the direction we needed to go, so we got to it! We were barely 25 yards into the real hike, when Bill got a sharp pain in his foot. We stopped, he adjusted his shoes a little, but I could tell he was in pain. He was limping along, and we were moving at a snail’s pace. This was not good. It’s a good thing today was going to be easy. Easy? Yeah. Right. The “gentle roller coaster” was, to us, more challenging than the sharp downhills and stream crossings we had completed on day one. And we need to do this for 12.3 miles? Just great. It took us several hours to get to site 81, which I guessed was about 4 miles from where we had spent the night. We were ready for a break, so we stopped there for lunch, to bathe, and to wash our clothes. It was a beautiful day, probably nearing 80, and we hadn’t seen any other hikers on the trail so we figured it was as good a spot as any to strip down and freshen up! After lunch, we were refreshed and ready to tackle the next 8 miles of our journey. Bill’s pain came and went (he’s a tough one, so I couldn’t really tell when he was really hurting or not), and my feet started to hurt again. All this walking in barefoot shoes with little training was catching up to me. We crossed paths with a couple on the trail- only our second set of hikers since we’d left the AT- smiling and saying hello, but not stopping to chat, since we knew we had a ways to go before the day was done. Time was ticking by, and these miles just felt SO LONG. How come we hadn’t passed the next campsite yet? Bill and I started talking about a plan B for the night: we could stop at site 77, camp there for the night, and then play catch up the next day. I was a little hesitant to stray from our itinerary (after all, that’s what we told the ranger), but by the time we reached site 77, I knew we needed to stop. We were exhausted and it was late in the afternoon. If we rested here for a little and then kept up this pace for the last 4 miles, we’d probably roll in to camp as sun was setting, which is not what we wanted to do. We figured it was in our best interest to take a “short” day (8 miles), recover, and hit the trail hard the next day. The campsite was empty, with the exception of two XL cotton tee shirts sitting in the fire ring- signs that someone had been here recently. Other than that evidence of humanity, this camp really felt like we were in the wilderness. We were certainly OUT THERE, and it felt both freeing and scary at the same time. 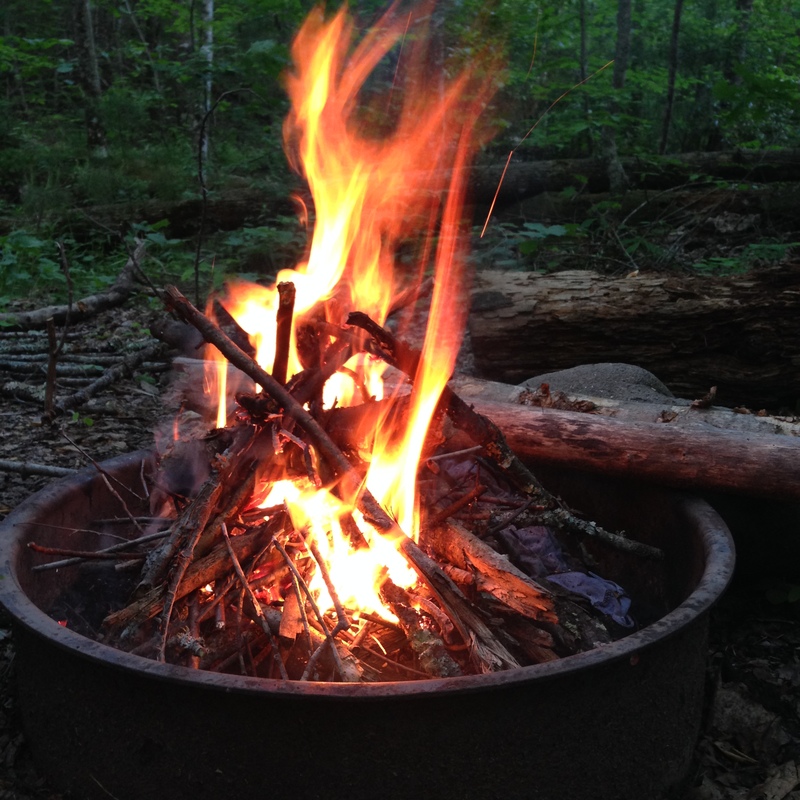 Since we were in camp fairly early and it had been dry all day, we gathered up plenty of firewood and made a real fire! Camp fires may be my favorite part of camping. They just make the whole experience feel real. We sat by the fire and ate some Backpacker’s Pantry Veggies in Peanut Sauce, which I found to be quite tasty, but quite messy. As I opened the peanut butter packets inside (which were Peanut Butter and Co, by the way!) I had a mini freak out in my head wondering if bears like peanut butter as much as dogs do. I don’t know the answer to that, nor do I want to find out! So I made sure to be as neat as possible, but still ended up with stickiness and peanut butter on my hands. Multiple trips to the stream to wash off were necessary! 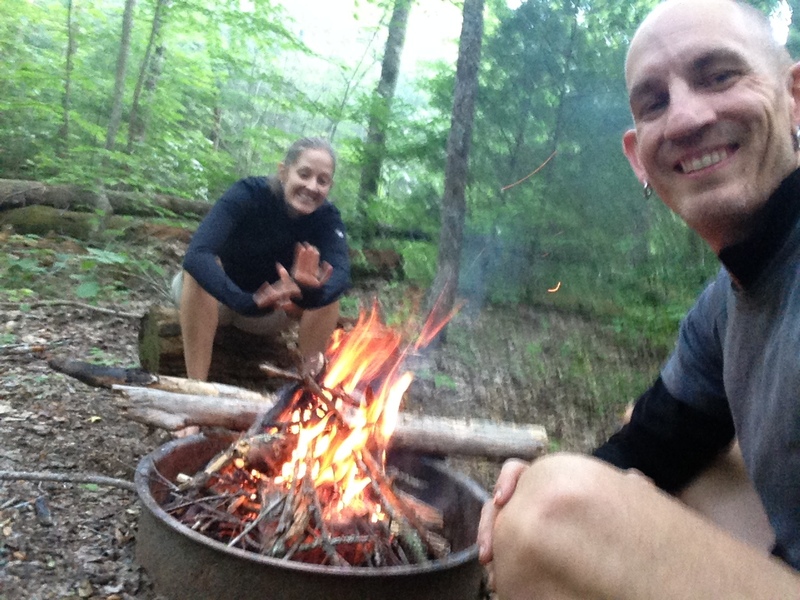 We wrapped up dinner, and just relaxed by the fire before heading to the tent for bed. It was dusk at this point, and off in the distance we heard an owl, and then some other bird that squawked for so long that we questioned whether it actually was a real bird. We weren’t as beat up as we had been the first two nights, so we actually were awake when it finally got dark out. We were just taking in the vastness of the forest around us when we heard a loud rustle not far from our tent. Both of us stiffened up. What was that? We shined the light out into the distance and saw the last few sparks from our camp fire surrounded by darkness. We turned off the light and sat in stillness, looking out into the night. When our eyes had adjusted back, we saw a little flash of light off to the left, and then again off to the right, and then out front of the tent. There were fireflies! They certainly weren’t the thing that had made the rustle we had both heard, but they lightened the mood a little. Bill barked again, cutting the stillness, still on high alert. I convinced myself that he had scared whatever it was away, and let myself fall asleep. Hopefully we’d be left alone for the night.